The story of The Raymond Mercantile is intertwined with the beginnings of Raymond. In 1896, Charles McCarthy left American Fork, Utah to start a ranch in Canada. He had purchased 17,000 acres of land near Cardston which he called the Spring Coulee Ranch. When Jesse Knight sent his two sons to Canada in 1901 to explore the idea of purchasing land, it had come at the urging of Charles McCarthy and Apostle John W. Taylor. As a result of that trip, Jesse Knight bought 30,000 acres next to the McCarthy’s ranch. Within a few months, on a trip to examine his Canadian land, Jesse Knight made the decision to buy 300,000 more acres and build a Sugar Factory and town between the fledgling communities of Stirling and Magrath. When the site for Raymond was dedicated on August 11, 1901, McCarthy was one of the 150 or so present. Within months of the creation of the community of Raymond, McCarthy saw a business opportunity. He contracted Charles W. Lamb to build the Mercantile and the McCarthy Hotel. The Merc stocked everything the growing town needed. The Merc served as a central gathering place for those early settlers. The first dance was held upstairs. It became the community’s first post office and McCarthy’s its first postmaster. 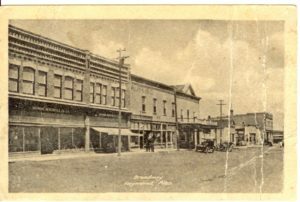 In November 1901, the first LDS Church services in Raymond were held in the second story of the building. In 1903, when Raymond was incorporated as a town, McCarthy was selected as its first mayor. In 1903 Heber S. Allen, a merchant from Cardston, was called as the first LDS Stake President for the newly organized Taylor Stake (headquartered in Raymond). When he relocated to the community he bought a controlling interest in the store. The Raymond Mercantile Co. Ltd. was incorporated on November 3, 1903. Sadly, the original Mercantile building, along with much of downtown, was destroyed by fire in 1926. Construction on the current building began almost immediately on the same site as the original. In 1965, the building was expanded to the south to include the area that now occupies the dairy and meat sections.